I'll keep BG Reynolds in my back pocket for an emergency. You've reminded me it's time to order another 12 pack of the Lillikoi's. I picked up a Caroni 15 yr from a friend today. A bunch of us imported bottles together to split the shipping. Looking forward to trying it. Caroni is like a heavily peated Scotch in that it can be an acquired taste. Some bottlings are seriously funky. Looking forward to hearing your thoughts after you taste it. That's what my friend told me. I'm a fan of funky so I'm really looking forward to it. Back from a little time down island! Here is the lovely M/S Sagitta that served as my home last week. Here is the Sagitta. Built as a motor vessel in the 1960's it had mast added later in life to make it pretty for tourists when it started sailing in the Galapagos (despite the sails it is still primarily a motor vessel). Now it sails mostly in the Lesser Antilles. In my case it started in St. Lucia and made stops in Martinique, Dominique and Iles des Saintes, a small island group that is part of Guadeloupe. Despite my best efforts I could not convince the Captain to go to Marie Gallant instead (Iles des Saintes has no rhum distilleries but did at least have a few shops with Guadeloupe rhum). But it is clear to me that short of winning to the lottery so that I can charter my own yacht I will have to fly down and stay a few days on Martinique, Guadeloupe and of course Marie Gallant. A cruise just doesn't provide enough time. I did convince the Captain to stop for a half day in Fort de France so that I could make a trip out to Clement. 9 of the 12 passengers were swayed by my tales of rhum to join me on the tour and all seemed to have a grand time! Who wouldn't given you can taste practically anything in the gift shop for the price of the tour (12 euro for one but our group of ten got a discount down to 8.7 euros or less than $10!). I was having such a good time I forgot to take a picture of the many bottles available to try! 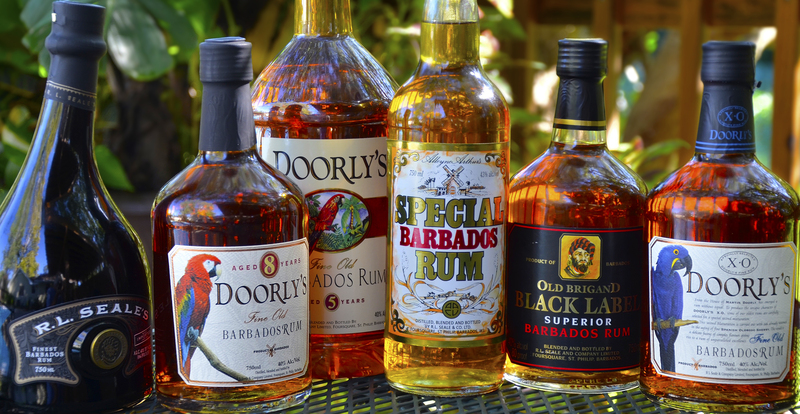 Among the 7 bottles I returned with one was a 5yo English Harbor from Antigua which was a gift from one of my tour guides and a fellow rum enthusiast as well as the 1931 from St. Lucia that I picked up in duty free (no Blanton's SFTB to be found in St. Lucia duty free sadly). Others I brought home included two from Guadeloupe. One was the Montebello 10yo and Bologne, a 3-8yo blend of supposedly the best of recent vintages. (the Bologne blanc is supposedly the most popular in Guadeloupe). Also include was a 118 proof blanc from Bellevue in Marie Gallant (it was the only bottle with any proof I found except for other Blancs). Unfortunately nothing aged from Marie Gallant could be found. A couple of interesting finds in Clement included a 15yo bottle which I have not seen in the US and a 20yo of the 1976 vintage (one of the three vintages used in the original Clement X.O. but obviously much older). The color on both of those is pretty intense! But I have not tried either yet. Sadly those were some of the few options you couldn't try in the gift shop. I also learned the Clement (and probably many others) periodically top up their barrels over time to compensate for the high rate of the Angels Share. Supposedly this is done using only rhums from the same vintage. Sounds like an awesome trip! Nice Rum haul too. Be sure and post tasting notes for us less fortunate. Bought a SA Revelation Rum today at a local store on sale for 40. Been looking for this for over a year in multiple states (and in that same store) so when it showed up on their blog I was pleasantly surprised and quickly hit order. Gotta wait for the weekend but looking forward to opening it. Bought a SA Revelation Rum today at a local store on sale for 40. That is a crazy good price. Tasty good stuff and even better at that price. Nice job! Today I ordered some oddball Demerara rum from a small bottling company known as Moon Imports. Based in Italy I think, although they don't do much marketing and don't have much of an online presence (ie none at all). Anyway it's a patent still rum, which could mean one of several of DDL's stills, but based on Moon's experience I expect it's not their industrial flavorless vodka style. The price wasn't bad at 50 euros a bottle, worth a hunchy gamble. Also bought a few more of the Cadenhead's cask strength stuff - A far better buy these days than most whiskeys. Actually bought this on a road trip last week. None of these are available locally. All distilled, blended and bottled by Richard Seale at Foursquare. You'll be happy with all of those! I've been on a Foursquare kick lately as well. 2x each of Doorly's 12, Port cask, and 2004. Great quality and value here. Yeah, I'm 8 deep on the Foursquare 2004 and a couple deep on the 2006, loves me some Foursquare. The R.L. Seale and the Doorly's XO are staples but I hadn't tried the 5yr till last weekend. I grabbed an extra Mount Gay Black Barrel that's on sale for $14 locally. I have a bottle of it open now and it's a pretty solid (but easy) sipper. I ordered a bottle of Caroni 15 today based on the positive reviews here. Sounds like my kind of weird! The Scarlet Ibis - I saw this Trinidadian rum here recently for the first time. I think this is generally a tiki drink component but I love funky rums so figured it was worth a try on it's own. Thought it was very good, somewhat fruity along with notes of molasses. Some heat but drinkable neat. Neisson Eleve Sous Bois - I have little to no experience with rhum agricole but I thought this was really nice, light and grassy with a somewhat dry finish. I had a second pour of this. Wray and Nephew Jamaican white overproof rum - I'm not sure what possessed me to order this neat, but it was surprisingly good this way. My palate was warmed up by this point in the night so it did not seem overly hot at all. Lots of molasses flavor, no weird new-make chemical notes I could detect. Straightforward but good. I decided to pick up another bottle of the Foursquare 2004 since I've really been enjoying my open bottle of it. Also, my comment above was meant for the "What rum are you drinking today?" thread, so apologies for that. I picked up a bottle R.L. Seale's 10yo and Doorly's 12yo over the weekend. I really like the Foursquare 2004 and figure I should try more of their lineup. Skipper Demerara Dark Rum and Woods Old Navy Rum along with a Kill Devil single cask, cask strength (62%) 24yr Jamaican Rum distilled at Hampden all found their way to me last week. Dove into the Skipper and the Woods yesterday and while they are interesting and a fair price in England are both Rums I would use for mixing rather than sipping. I bought a bottle of Lemon Hart 151 today. First time I've seen it around here so felt like I should grab it. Is this still hard to find? I know it disappeared for a little while when it changed ownership, but I'm curious if it's readily available in other parts of the country now. Picked up one each of the new single barrel Jamaican rum offerings from K&L, bottled through Hunter Laing's Golden Devil line. Included are a 24yo Hampden, 10yo Worthy Park, and a 9yo Monymusk. I couldn't help myself and I popped open the Hampden as soon as I got home. It is lighter bodied than I anticipated, but has lots of fruit, fuel, and funk. Will have to do a SBS with the 14yo Hampden that they brought in a year or two ago. I thought you might grab some or all of those! Interesting about the 24yo Hampden. Will be curious about the comparison to the younger version and to hear about the other two when you get around to them. For the moment I am going to pass having blown the budget for the umpteenth time on rhum agricole down in the islands. Was hoping to do a tasting of a few of those agricoles yesterday in a special Thursday edition of Wednesday tastings but wasn't able to fit it in. ...For the moment I am going to pass having blown the budget for the umpteenth time on rhum agricole down in the islands.